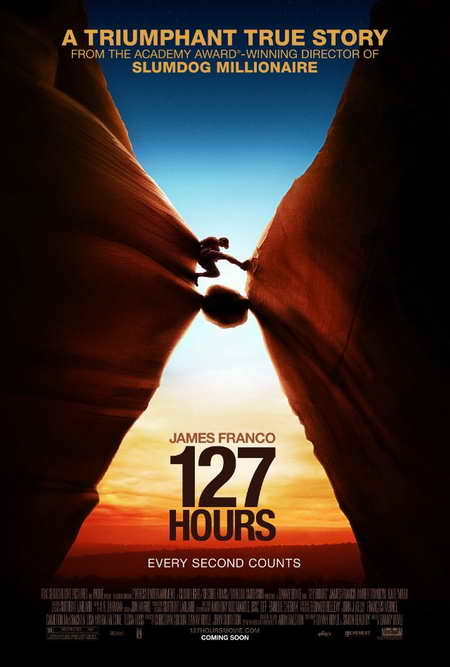 This is the true story of adventurer Aron Ralston (James Franco) who, while hiking in the mountains of Utah, falls into a crevice and a boulder crushes his right arm. Over the next five days, Ralston discovers that he has the wherewithal to extricate himself and to survive by any means necessary. This is not a story about heroism, its Ralston’s ego that got him into the trouble in the first place. It’s not about hidden reserves of power we find when faced with a crisis because Ralston goes above-and-beyond what most of us would do in any circumstance. It’s a story about optimism –about how a simple guy turns his life around, just as any of us can, and should, in any hemmed-in circumstance we may find ourselves in. Danny Boyle is no stranger to using dark material to convey optimism and vibrancy. In his film Slumdog Millionaire, we see unimaginable poverty, child beggars having their eyes gauged out to increase begging profits, and girls being forced into prostitution, yet for most critics and audiences alike, it’s ‘the feel good film of the decade.’ In 127 HOURS, Boyle doesn’t linger on the horror of this situation, or the gruesome things Ralston does to free himself, but rather on the liberation that this experience is for him. That said, this reviewer felt that while it would be interesting to watch a 30 minute documentary on Aron Ralston’s experience, there isn’t enough subject matter to make it an interesting feature film.